R2-D2 (called "R2" for short is a robot character in the Star Wars universe created by George Lucas. An astromech droid (referred to in the novel as a 'thermocapsulary dehousing assister'), R2-D2 is a major character in all Star Wars films. Along with his protocol droid companion C-3PO, he joins or supports Anakin Skywalker, Luke Skywalker, Princess Leia, and Obi-Wan Kenobi in various points in the saga. R2-D2 has been played by English actor Kenny Baker in all six original Star Wars films and is due to reprise the role in Star Wars: The Force Awakens, the first installment of the upcoming sequel trilogy, making him one of just two characters/actors along with C-3PO (portrayed by Anthony Daniels) to appear in all seven films. George Lucas's creation of R2-D2 was influenced by Akira Kurosawa's 1958 feature film The Hidden Fortress (USA release 1962), particularly Tahei and Matashichi, the two comic relief characters that serve as sidekicks to General Makabe. Lucas also drew inspiration from the robots Huey, Dewey, and Louie from Douglas Trumbull's 1972 film Silent Running. The name is said to derive from when Lucas was making one of his earlier films, American Graffiti. Sound editor Walter Murch states that he is responsible for the utterance which sparked the name for the droid. 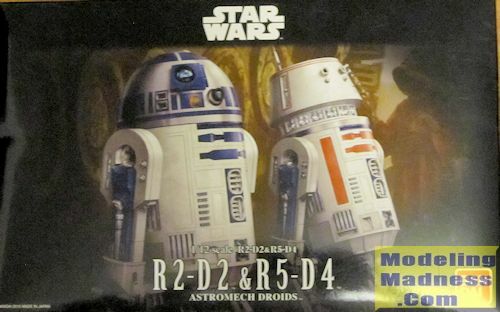 Murch asked for Reel 2, Dialog Track 2, in the abbreviated form "R-2-D-2". Lucas, who was in the room and had dozed off while working on the script for Star Wars, momentarily woke when he heard the request and, after asking for clarification, stated that it was a "great name" before falling immediately back to sleep. R2-D2 stands for Second Generation Robotic Droid Series-2, according to a Star Wars encyclopedia published after the release of the film Star Wars Episode IV: A New Hope. Astromech droid originally sold to Owen Lars on Tatooine before it malfunctioned. The bad motivator allegedly caused by R2-D2 to continue his mission. R2D2 comes with all the tiny attachments that were used in the various films minus Luke Skywalker’s Lightsabre which he stored in Return of the Jedi. 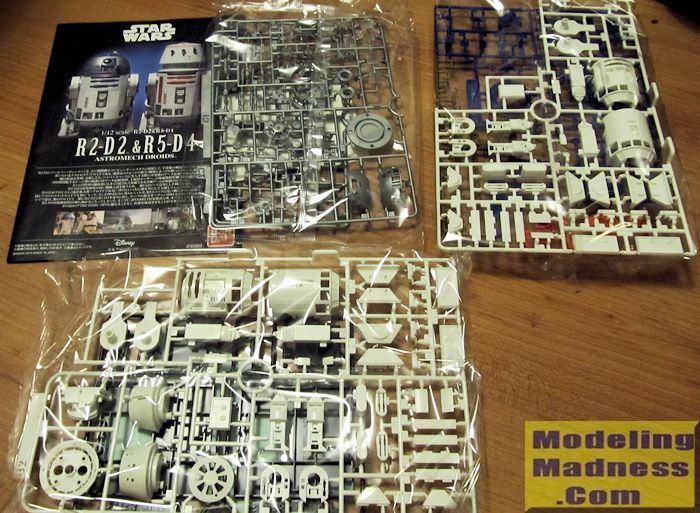 It also contains the complete markings for both droids as waterslide decals or stickers. The color instruction booklet provides extensive diagrams and decal placement. It is easy to follow despite being written in Japanese.